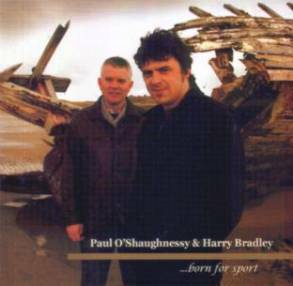 Now here really is one humdinger of an album which features the erstwhile Altan fiddler Paul O’Shaughnessy and one of the shining lights in Belfast’s firmament of flutes, Harry Bradley, in cahoots with seemingly every Irish musician’s current favourite accompanist, John Blake, on bouzouki. Of course, Paul is no mean flute-player himself and in the past forged a potent duo with another fine musician of that ilk, and fellow-Dubliner, Paul McGrattan. That rapport is thoroughly replicated, and perhaps even surpassed, by ...born for sport which sees O’Shaugnessy and Bradley united in the single-minded aim of bowing their equally powerful presences to the tunes in hand. And, boy, are there some fabulous tunes here! More than a smidgeon derive from Paul’s thorough grounding in the Donegal fiddle tradition and pay homage to past musicians such as John Doherty and fiddlers from Glencolmcille and Teelin in the county’s southwest – and it’s grand to see one of the great (and still living) figures of Donegal music, Kitty Sheain Cunningham of Teelin, who lilted Paul the single jig Baitheadh Bhrioclais, being acknowledged. Harry’s sources range from the Sligo greats, such as Coleman and Killoran (and his flute is inspired by another from adjacent Leitrim, John McKenna), to Dublin pipers, lilts from Louth, and musicians from Down and Fermanagh. While together both Paul and Harry were inspired by the singing of Cork’s Elizabeth Cronin to turn The Little Pack of Tailors into a staggering tour de force of a barndance. No matter the source, however, the pair and John Blake combine to create music of boundless vitality in which all three’s technical expertise is graced by the most subtle embellishment and the melodies ever linger in the cerebral cortex. Apart from the sheer delights of the duets there are also two staggeringly eloquent solos on which fiddle and flute seem to vault skywards from a standing start and then simply soar purposefully around the cosmos. Don’t miss this one – it’s a classic. This review by Geoff Wallis was originally written for fRoots magazine. The CD is distributed by Claddagh.